Thich Nhat Hanh is a Zen master, poet, peace activist, and the author of many books, including Peace Is Every Step and The Miracle of Mindfulness. 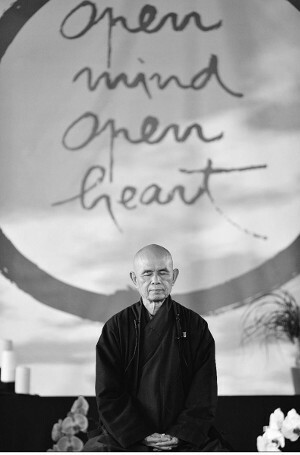 He was born in Vietnam in 1926, and left home as a teen of 16 to become a Zen monk. He founded the School of Youth for Social Services, Van Hanh Buddhist University and the Tiep Hien Order (Order of Interbeing), in Vietnam. He has taught at Columbia University, Princeton University and the Sorbonne, was Chair of the Vietnamese Buddhist Peace Delegation to the Paris Peace Talks, and was nominated by Martin Luther King Jr. for the Nobel Peace Prize. He was exiled from Vietnam in 1966 and lives in a monastic community in southwestern France called Plum Village. "We must be aware of the real problems of the world. Then, with mindfulness, we will know what to do and what not to do."